Galway, in southern Ireland, was part of Britain 100 years ago, becoming part of the new Republic of Ireland in 1921. The Galway and Salthill Tramway Co. Ltd. was formed in 1876 for the purpose of constructing and operating a horse tramway to connect the city of Galway, on the west coast of Ireland, with the coastal village of Salthill just over two miles away. Galway was a bustling city at the time and Salthill was becoming a fashionable and sought-after area to live for Galway business people and others of means. On summer weekends, Galway was a popular destination for day-trippers by train from other parts of Ireland and the horse tramway to the beach at Salthill was well patronised. Construction started in June 1879 and the 3ft-gauge line was single track with six passing loops at fairly regular intervals along the route. It ran from Eyre Square in Galway to the beach at Blackrock Road in Salthill. The tramway was opened on 1 October 1879 after an earlier and satisfactory inspection during which, allegedly, the two horses on the double-deck inspection tram galloped from Salthill to Galway! Blarney? The fleet consisted of several 36-seat, two-horse double-deck trams and some single-deck, one-horse trams. The depot, with stabling, was in Forster Street, near Eye Square, in Galway. During the 1880s, there were several plans to add to the tramway, including a branch from Eyre Square to the railway station, but no extensions were ever built. The tramway had an uneventful life and survived through most of the First World War, but finally closing on 12 May 1918. 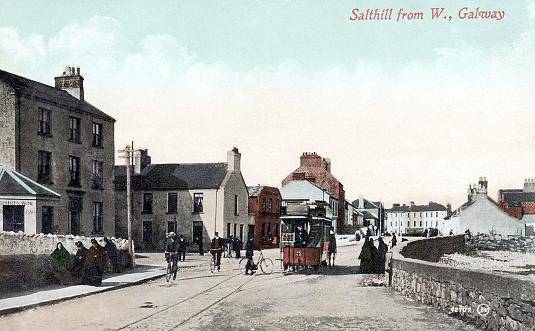 Our postcard (by the well-known publisher J. Valentine of Dundee) shows double-deck tram number 3 at the Salthill beach terminus on a sunny afternoon around 1904. The street scene here is barely recognisable today.